WinX DVD to iTunes Ripper for Mac is a free DVD to iTunes ripper which is made for Mac users to convert and transfer DVDs to iTunes or Music files. It is designed for Mac OS X Tiger/Leopard/Snow Leopard. Last update 23 Apr. 2010	Licence Free	OS Support Any Mac OS	Downloads Total: 551 | Last week: 0 Ranking #15 in iTunes Tools Publisher Digiarty Software, Inc.
WinX DVD to iTunes Ripper for Mac is born with the purpose of bringing Mac users a 100% free DVD to iTunes converter. Especially designed for Mac OS X Tiger/Leopard/Snow Leopard, this free DVD to iTunes ripper is featured variety easy-to-use and professional functions, which enable its users to rip DVD to iTunes, convert DVD to Music format with fast, easy and smooth ripping process. WinX DVD to iTunes Ripper for Mac is made for Mac users, who are running with Mac OS X Tiger/Leopard/Snow Leopard, to convert and rip DVD to iTunes. 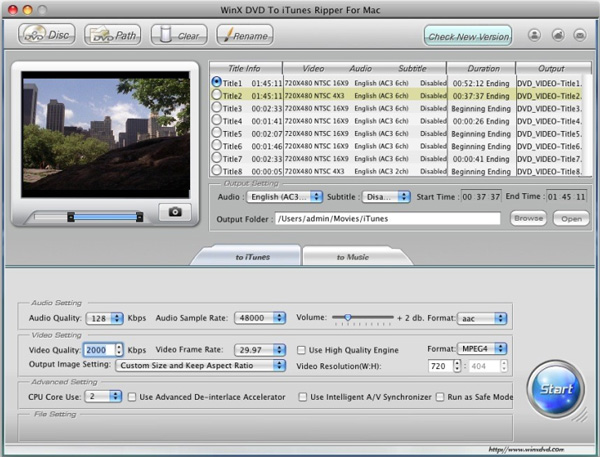 WinX DVD to iTunes Ripper for Mac enables users to extract audio out of DVD and save as Mp3 Music file. It can also grab DVD movie image to BMP or JPG format. This free DVD to iTunes ripper supports renaming the converted video files in batch mode. It can freely split and trim videos to separated clips. Moreover, with all the adjustable parameters, WinX DVD to iTunes Ripper for Mac makes users fully control output audio quality and image size. "Advanced De-interlaced Accelerator", "Intelligent A/V Synchronizer" and "Run as Safe Mode" functions, etc, all these advanced and unique technologies offer users stable DVD to iTunes ripping process and excellent output quality.